The Wyoming County Commissioners, along with (top, left) solicitor Paul Litwin and chief clerk Bill Gaylord (right) accepted the resignation of County Domestic Relations administrative assistant Carrie Beebe at their Nov. 29 meeting. 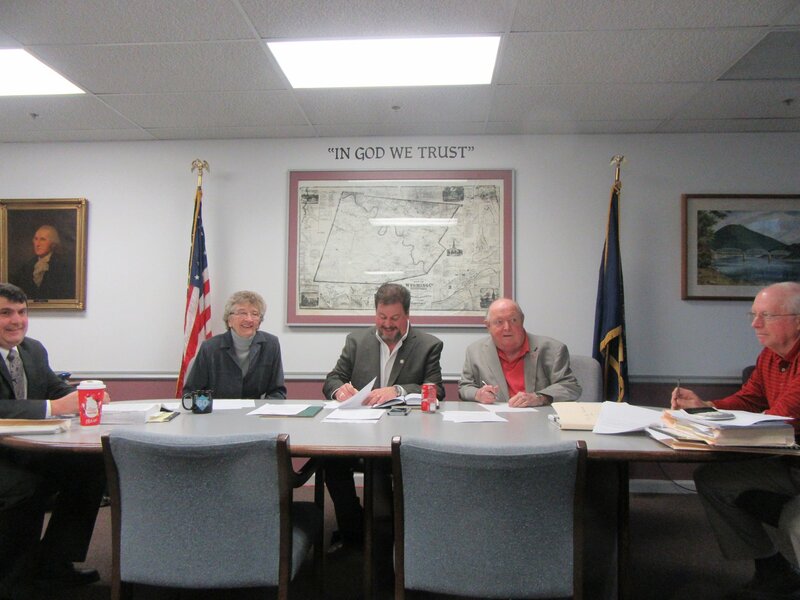 As part of what was perhaps the shortest public meeting of the Wyoming County Commissioners in 2016, the three-member board signed a number of standard Children & Youth Services agreements, shared some of their experiences from a meeting of the County Commissioners Association of Pennsylvania (CCAP) held recently in Hershey and announced the resignation of Carrie Beebe from the Domestic Relations Office. “We accept her resignation with regret,” said Commissioner Ron Williams. Beebe has worked for the department for 16 ½ years and will be officially retired on Dec. 31. “She always has a smile on her face,” Commissioner Tom Henry remarked. 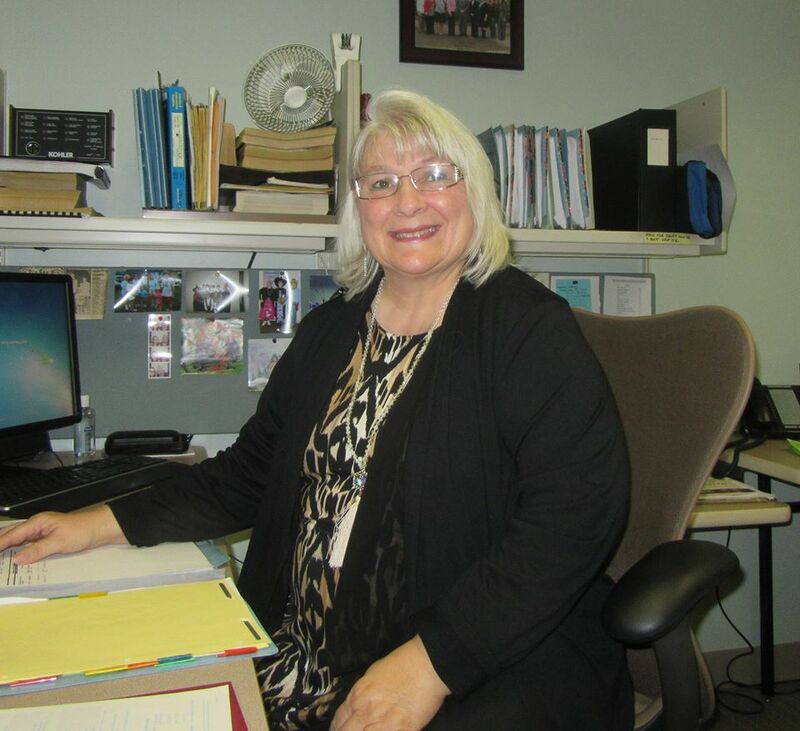 A resident of Factoryville, Beebe related afterward that she has no immediate plans for her retirement other than to take a break and “do nothing” for a while. The commissioners attended a CCAP conference Nov. 20 to 22 at which they participated in workshops and meetings on a number of topics, including economic development, strategic planning, and drug trafficking in Wyoming County and across the state. “We learned a lot of things that we will hopefully be able to apply to this county,” said Commissioner Judy Mead, who noted that one of the highlights of the conference was a presentation about energy development in Pennsylvania. “Pennsylvania can become a world leader in energy production if we progress solidly.” Natural gas, oil, wind farms and solar power are all part of the equation, she acknowledged. “And we still have coal,” Henry added. The biggest concern shared by commissioners across the Commonwealth, Mead related, is a fear that the state’s budget will not be passed on time again this year. Human services were heavily impacted during the last budget impasse, and commissioners statewide are already looking at alternative funding sources to mitigate the effects. “We’re still recovering from the last time,” Henry said of last year’s stalled budget, adding as an aside that he hopes that Gov. Tom Wolfe does not run for reelection. On a lighter note, the commissioners reported that the issuing of proclamations to members of the 8-9-10 Tunkhannock Girls Softball team at the Triton Hose Company on Nov. 27 was an exuberant affair. Chief clerk William Gaylord related that an interesting highlight of the event was the presentation of a jar that contained layers of dirt from each of the fields in which the girls played that led to their 16-1 season record and state championship, the first since 1977. The public meeting was adjourned and was to be followed by an executive session that county solicitor Paul Litwin requested to address a personnel issue and some concerns about the pending purchase of the county’s former wood yard along Route 6 in Tunkhannock Township. The executive session could have interrupted the meeting, but the commissioners agreed that, holding up the three members of the media – the sole audience for the public meeting – was unnecessary. The board also concurred that no action would be taken on any of the items to be discussed and, therefore, there would be nothing to report from the executive session. The next meeting of the Wyoming County Commissioners will be held at the Wyoming County courthouse in Tunkhannock on Tuesday, Dec. 13, after a meeting of the Wyoming County Prison Board at 9 am. Both meetings on Dec. 13 are open to the public.